Samuel Riba, the self-pitying publisher at the center of Enrique Vila-Matas’ recent novel Dublinesque, refers to many authors in the course of that literature-infused book, but what was said about Julien Gracq made me take note and order some books. [Riba had] published lots of important authors, but only in Julien Gracq’s novel The Opposing Shore did he perceive any spirit of the future. In his room in Lyon, over the course of endless hours spent locked away, he devoted himself to a theory of the novel that, based on the lessons apparent to him the moment he opened The Opposing Shore, established five elements he considered essential for the novel of the future. These essential elements were: intertextuality; connection with serious poetry; awareness of a moral landscape in ruins; a slight favoring of style over plot; a view of writing that moves forward like time. It was a daring theory, given that it put Gracq’s book, usually considered antiquated, as the most advanced of all novels. At first, Gracq’s prose seems to originate in a hyper-intense form of observation. Unlike a naturalist, however, Gracq is only marginally interested in the mechanics of nature. His interest lies in the act of perception and in the relationship between art and perception, and his description of a scene presents us with a world that is no longer natural but that has been internalized and reorganized for us, as if by the eye and mind of a painter or sculptor. The best way to show this is to quote a generous passage in which he describes a place appropriately named the Valley of No Return. Le Val sans Retour looks nothing like what one might imagine: neither the narrow cleft, like a saber slash, which provides access to an infamous gorge nor the somber green of lowlands choked by trees whose branches rain sleep like those of the manzanilla. It is only a rather deep ravine, wide open on both sides, that has dug itself a winding swath through a high plateau of fallow land and moors; to the west extends the forest of Paimpont, whose farthest treetops can be made out at view’s end and look like the scattered flags of some rear guard retreating behind the horizon. From the top of the hill, the valley’s panorama, the absolute leveling of the line of the horizon, seizes the eye – a worn-down base, a planed block into which is sunk the valley’s closed-in, finger-like enclave with its short tributary ravines arranged like the veins of a leaf. The rocky skeletal structure surfaces at each point on the slopes as well-worn, flattened, rounded, lichen-encrusted rocks of a dull white hue, a color that haunts Brittany. A rough, sparse vegetation occupies all of the intervals; trails of dry rush, low, darker green brushloads of broom and gorse spread out like scabrous sheets, misplaced oaks, stands of dwarf fir cascading in black trails to the bottom of the ravine. Up where the slopes reach the plateau, as soon as their angles diminish, thickets of stunted chestnut trees, roots exposed, cling to everything stiff as stubble on a shaved neck; in winter, a jumble of birches stripped of all but the tiniest twigs fills the bottom of the ravine with the soft gray of mouse down so dense it’s mistaken for mounting fog. Only when I finished the book’s fifty-four pages did I fully realize how modern life had been effectively eliminated from its pages so that Gracq could focus the reader within it’s miniscule geography. With the exception of two or three passing references to a car and a single mention of the Vichy government, the entire twentieth century is absent from his narrative. Like a bell jar, The Narrow Waters consists of a hermetically-sealed landscape that contains a tiny man with his tiny boat and a boundless stock of memory and imagination. Here, already spreading out across the river, grew the floating green constellations of water chestnuts that we would lift up on the return trip like a fishing net to harvest the nuts with their sharp protuberances: small, spiny, vegetal skulls that harden when cooked and that produce, when split, instead of a brain, a nut tasting of sugar and mud, crumbly, grainy, crunch between the teeth. Gracq’s narrative continually flows between memories of the river and memories that the river evokes, memories that are, more often than not, derived from the books of authors such as Edgar Allan Poe, Thomas De Quincey, Gaston Bachelard, Gérard de Nerval, Arthur Rimbaud, Honoré de Balzac, Jules Verne. Like Proust, he traces the most powerful of these literary memories back to childhood. For Gracq (and this is undoubtedly a source of Vila-Matas’ admiration for his work), memories derived from reading are just as powerful and real as memories drawn from “experience” – perhaps even more so. I am unable to resist these clusters of recollection, these adhesive elements that the impact of a cherished image hurriedly, anarchically condenses around itself, bizarre poetic stereotypes that, in our imagination, coagulate around a childhood vision in a jumble of fragments of poetry, painting, or music…it is through connections that bind them together that the emotion born of a pastoral spectacle can extend freely across an artistic network – plastic, poetic, or musical – and traverse great distances without the least loss of energy. 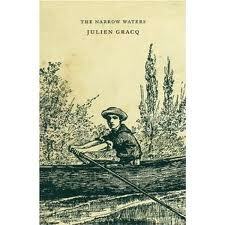 Julien Gracq, Narrow Waters. NY: Turtle Point Press, n.d. Translated from the French by Ingeborg M. Kohn. Near the church we met Legrandin, who was coming in the opposite direction escorting the same lady to her carriage. He passed close to us, did not break off his conversation with his neighbor, and from the corner of his blue eye gave us a little sign that was in some way interior to his eyelid and which, not involving the muscles of his face, could go perfectly unnoticed by the lady he was talking to; but seeking to compensate by intensity of feeling for the somewhat narrow field in which he had circumscribed his expression, in the azure corner assigned to us he set sparkling all the liveliness of a grace that exceeded playfulness, bordered on mischievousness; he overrefined the subtleties of amiability into winks of connivance, insinuations, innuendos, the mysteries of complicity; and finally exalted his assurances of friendship into protestations of affection, into a declaration of love, illuminating for us alone, at that moment, with a secret languor invisible to the lady, a love-smitten eye in a face of ice. But at the name of Guermantes, I saw a little brown notch appear in the center of each of our friend’s blue eyes as if they had been stabbed by invisible pinpoints, while the rest of the pupil reacted by secreting floods of azure. 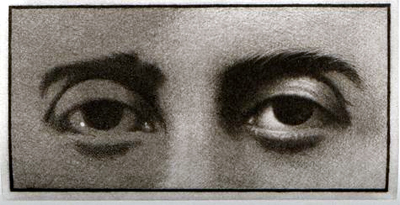 Using the eyes as a window on the soul or as a mouthpiece for true character is a great literary device with a long tradition, one especially suited to Proust, who always wants to leave us uncertain about the objectivity of his narrator’s perceptions.